A Mosul resident looks at the ruins of a damaged historic house in his neighborhood in Mosul's Old City. The United Nations estimates 8,000 homes were damaged or destroyed in the fighting to take back this section of Iraq's second-biggest city. Ghanem Saleh, who leads a renovation crew repairing shops on a market street in Mosul's Old City, pulls out the windshield of his car. It was damaged when an airstrike hit the building behind him, where ISIS had parked a car bomb. Radhwan Shukri owns the first tea shop to reopen in Mosul's Old City. Shukri closed his shop after he was repeatedly arrested and whipped by ISIS for letting his customers smoke. He reopened the shop a few months after the city was taken back from ISIS last year. An alleyway in a street on Mosul's Old City. Some of the streets have been cleared of explosives and rubble from collapsed houses, which prevented people from reaching their homes. Other streets remain covered in debris. 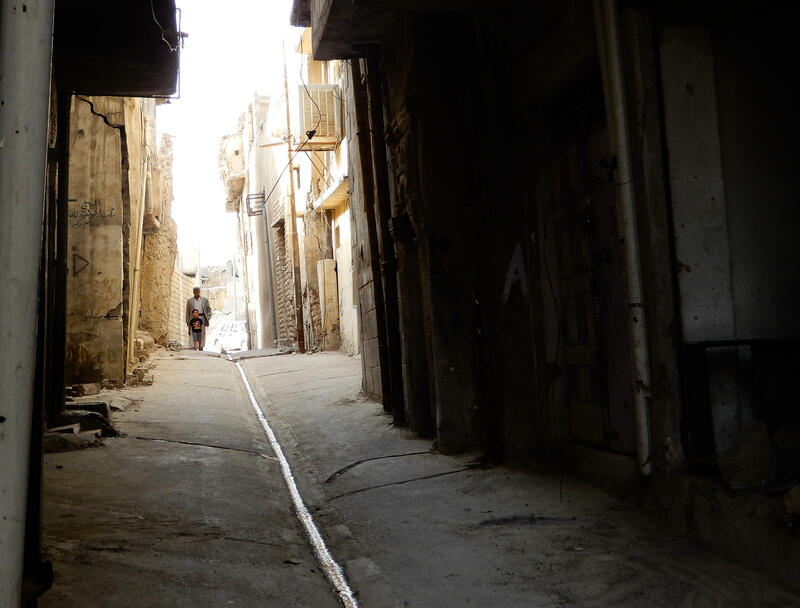 Before 2014, Sarjkhana Street, near the covered market in Mosul's historic old section, boasted hundreds of shops. The street was a legacy of Mosul's status as a thriving commercial hub dating back to medieval times. But the war that freed Mosul from ISIS rule last year left entire neighborhoods flattened. The shops on Sarjkhana Street were ruined. Explosives are still buried under the rubble and a lack of help from the cash-strapped Iraqi government and international organizations has left Old City residents to their own devices to try to rebuild — even as the eastern side of Mosul thrives across the Tigris River. The tiny, closet-sized shop being repaired is a women's clothing store. Owner Mohammad Mawafaq named the shop after his daughter Reemas and says he is spending $1,500 to rebuild it. He's one of the rare luckier residents to have both cash and stock from his shop, which he salvaged before it was damaged in the fighting. "Even if no one else came back," he says, "I would come back." That's how much he loves the neighborhood. 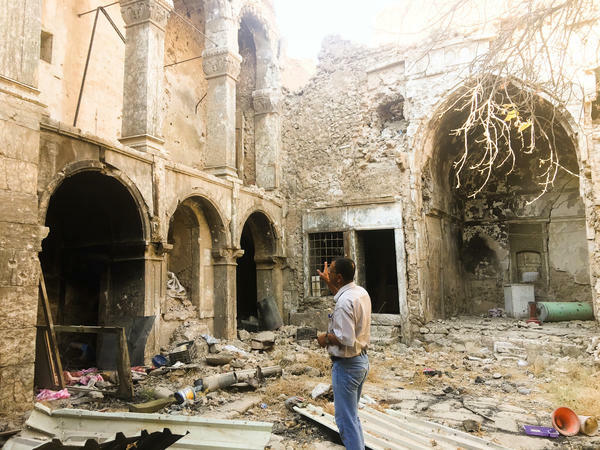 The United Nations estimates 8,000 homes in the Old City were either damaged or destroyed in fighting. Although it has programs to rebuild homes in other parts of Mosul, they haven't reached the oldest and most heavily damaged parts of the city. But the much deeper loss is of people. As Mosul was liberated, almost everyone in the Old City lost a relative — many lost multiple family members. Estimates range from 6,000 civilians killed — many of them women and children — to tens of thousands. With some bodies still under the rubble, no one has an exact count. The carpenter across the street, who gives his name as Abu Ahmed, is at work just three days after burying the remains of his nephew, who died a year ago. His 20-year-old son and his brother were also killed during the fighting. "We only found a few pieces of flesh from my nephew after the airstrike," he says. "We buried that. Three days ago, we found the rest of his body." Nearby, Ghanem Saleh is cheerfully working on renovating a pharmacy in a building where you can still see tangled metal and a gaping hole in the roof from an airstrike. He carries his tools in a beat-up car with completely shattered windows. An ISIS car bomb was being assembled inside the building complex when an airstrike hit the building. "I can either feed my family or fix my car," Saleh says. Mosul Governor Nofal al-Akoub, visiting the first tea shop to reopen in the neighborhood, says private donations have provided enough money to repair about 250 homes in the Old City. The government is still working on restoring water and electricity. "We don't have any money," he says. "The government doesn't have the capability for reconstruction. We just ask people to come and help." Iraq is ranked among the most corrupt countries in the world and Akoub chuckles when asked why the government has not provided money. "You know your answer," he says. "I think you want to make a problem for me." Akoub talks to a few people sitting in the tea shop before his guards bundle him into a car. "Sir, my request. Please take it," says a young woman, trying to thrust a folder of documents at him as his guards surround him and move toward a waiting car. She's one of more than a dozen women left standing on the sidewalk after being prevented from approaching. Their troubles are emblematic of the Old City's woes, which the government hasn't even begun to address. Almost all of them hold the paper or plastic file folders that many Old City residents carry everywhere with them, containing evidence of destroyed houses and details of missing relatives. "Nobody listens to us, they won't even let us enter their offices," says Ennas Abdul Salam. Her husband was an employee in the municipal water department with a security clearance from Baghdad, she says. He was arrested recently and she doesn't know where he is or why he is being held. Yusra Hussein, a young woman in a black gown with a floral headscarf covering her hair, shows a photo of her muscled husband in a bodybuilding championship. She says he was arrested nine months ago because his name was similar to someone on a wanted list. Her house is destroyed. "You see how unjust it is — all these people? How can we live?" Hussein says. "Suffering — the Old City is suffering." On the edge of the crowd, Sabah Hazem, who had hoped to speak to the governor, quietly sobs. Hazem's son was arrested. She carries a faded photocopy of a photo showing her house lying in ruins. She has late-stage cancer but doesn't have enough money for the taxi fare to cross the river to a medical lab, let alone to cover the cost of the tests. Another woman looking for medical treatment carries a 1 1/2-year-old girl who can't sit up and doesn't try to talk. And another, Muna Ibrahim, says she is afraid that ISIS will come back to the vacant house she moved into after her own house collapsed. "I can't afford to rent a house," Ibrahim says. "I'm afraid at night and I'm afraid in the day that ISIS will come back while I'm there." When it's clear the governor isn't coming back, the women gradually disperse, leaving a group of men sitting on battered wooden benches in the cooler air of the makeshift tea shop visited by the governor. Not everyone can afford a glass of the sugar-laden tea or the tiny cups of thick, sweet coffee. Many of them have just dropped by to get out of the searing heat. Thanks to an electricity line borrowed from a nearby police station, the tea shop owner, Radhwan Shukri, has powered an air cooler that recirculates water through a layer of straw. Shukri says when he reopened his shop a few months after the city was liberated last year, there were so few people in the neighborhood that his friends told him he was crazy. "When I first opened, I would make tea and then throw it out at the end of the day — there was nobody to buy it," Shukri says. "But now, thank God, people are coming back." 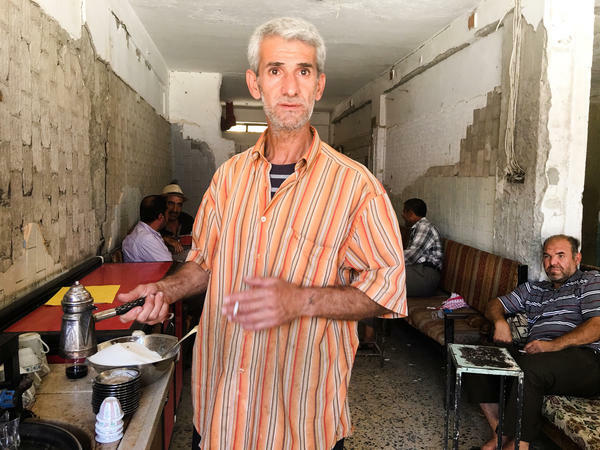 While Mosul was under ISIS control, Shukri closed the tea shop after he was repeatedly arrested and whipped with an electrical cable for letting people smoke — an activity ISIS forbade. "They said no one can smoke or sell cigarettes. But drinking tea without a cigarette doesn't work, does it?' Shukri says. "When I served tea, I didn't stop people from smoking." He says the first time he was caught, he was given 40 lashes, the second time, 50, and the third, 60. He was warned if they arrested him a fourth time, he would be executed. When Shukri came back to reopen the shop, he found the bodies of three ISIS fighters lying on the floor, and a truck full of weapons near the door. Shukri estimates about 600 families have moved back to the Old City — likely less than 10 percent of its pre-2014 population. But it's enough to make it feel as if the neighborhood is beginning to come back to life again, however painfully. "What we need is for the government to compensate people," he says. "You see all these people sitting here? They're all renting houses because their own houses have collapsed and they don't have the money to repair them. What we need is for the government to compensate people." Iraqi troops, supported by the U.S. and its allies, started their assault on the city's east side to retake Mosul after three years of ISIS occupation. But as forces pushed west and surrounded ISIS in the Old City, the fight became more and more brutal. By the time it was over in June 2017, airstrikes and artillery from Iraq and its U.S.-led partners had destroyed entire city blocks. According to the director of Mosul's central morgue, thousands of civilians were killed when their houses collapsed after being hit. Residents of the Old City resent being left under ISIS occupation for three years while other Iraqi cities were liberated. And they feel betrayed by having been left with no escape; they were told by Iraqi authorities to stay indoors while their homes became death traps. Around the corner from the tea shop, Faris Salih, an ex-army officer, is going through piles of concrete rubble, all that's left of his home, to see if there is anything he can salvage. "It's not repairable, I'm just taking the important things," he says, examining a washing machine whose motor had been looted. "I lost things that are much more valuable — my daughter and my brother." His eldest daughter Aisha was 13. She and her uncle were torn apart when the house collapsed in an airstrike. Before his house was hit, Salih could hear Iraqi military traffic on the radio talking about targeting three ISIS fighters in the neighborhood. He says he called contacts in the Iraqi army to warn them not to fire on the houses because civilians were everywhere. "But it was useless," he says, before turning back to his search. In the last few months, bridges have reopened across the river and Sarjkhana Street is full of taxis and trucks with people salvaging their furniture — there's even a line of cars in a wedding procession. In one of them — a spotless white sedan draped with a huge red ribbon and decorated with plastic flowers — a boy leans out the open window and gleefully sprays passersby with fake snow from a can as the driver honks the horn. 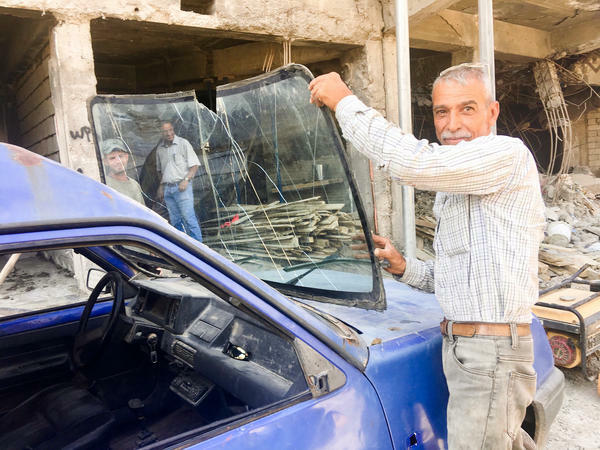 "Take a picture," urges Saleh, grinning as he stands with his tools by his broken car. "The Old City will come back better because our people struggle and they work," he says. "If the government helped us, in a year you wouldn't recognize the place."